Looking for a heart-healthy entree idea for your Valentine's Day dinner? 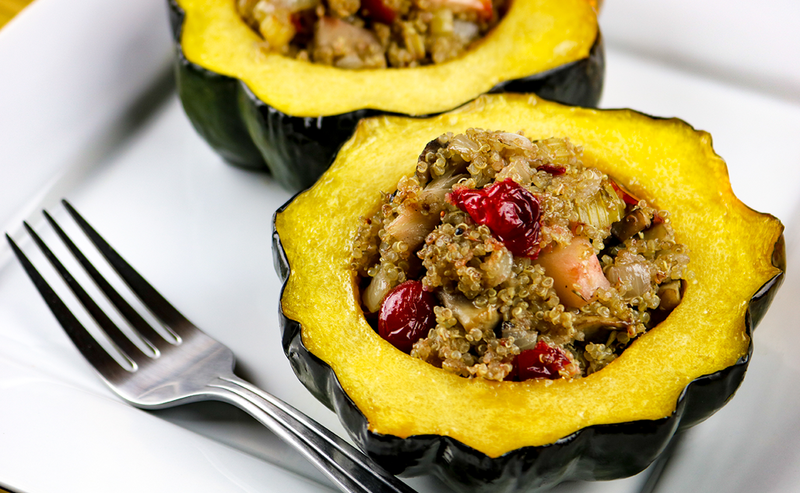 Why not try apple stuffed acorn squash. With Valentine's Day around the corner, many Winnipeggers are busy making arrangements for a romantic evening out with that special somone in their lives. Usually, such plans will involve a bouquet of flowers, chocolates and a night out at one of the city's finer restaurants. But let's not forget, February is not only the month of Valentine's Day. It is also Heart Month. That means it's not just a time to contemplate how you can make your loved one's heart grow fonder. It's also a time to think about what you can do to help it grow stronger. Why not start by re-thinking your Valentine's Day routine. For example, rather than going out on the town on Feb. 14, why not consider cooking up a "heart-healthy" dinner at home? Vegetables and fruits to lower your risk for all chronic disease. Whole grains that provide vitamins, minerals, healthy fats and fibre. Lower-fat milk and milk alternatives to help maintain healthy blood pressure and bone health. Meat alternatives like fish, beans, lentils and nuts that provide a great source of heart-healthy fats, and fibre. With that in mind, the Heart and Stroke Foundation has come up with a menu for a heart-healthy Valentine's Day dinner that will be as tasty as it is heart healthy. You can find heart-healthy recipes like these at www.heartandstroke.ca/get-healthy/recipes. Enjoy! Appetizer: Salmon yogurt spread with wholegrain crackers and cucumber slices. Cold water fatty fish like salmon, mackerel, and sardines have higher amounts of omega 3 fats and are best for your heart. Eating fish may help lower your risk for heart disease - and makes for an easy fancy appetizer. Boost nutrition by using plain, lower-fat yogurt instead of cream cheese or sour cream. It isn't a secret that dill goes well with fish, but did you know that using fresh or dried herbs boost flavour without adding salt? High salt intake is related to high blood pressure. And remember: as part of a heart-healthy diet, aim to eat at least two servings of fish per week. Entrée: Sweet potato soup with lime and wild rice, and apple stuffed acorn squash. Pairing these two dishes makes for the perfect entrée with a focus on transforming vegetables and fruits into a romantic and elegant meal. Including dark green and orange vegetables helps ensure you get important vitamins and minerals, plus fibre. This soup includes chicken, beans and vegetables, providing high-quality protein, carbohydrates, vitamins, minerals, fibre and phytonutrients! Even though the soup could be a meal in itself, pairing it with wild rice and squash adds valuable whole grains and veggies, with apple for natural sweetness. Did you know that dates add natural sweetness to your desserts while boosting the fibre? Nothing says romance more than rich chocolate flavour with fruit and nuts. Don't be turned off by the inclusion of beans - they provide more fibre and protein, and add a deliciously creamy texture. This dessert comes in the perfect portion size for a sweet ending to the perfect meal. Make the salmon yogurt spread the night before and store in the fridge. Cook the sweet potato soup in a crockpot so that it is ready when you are (or make it ahead of time and store in the freezer). Grains like rice, quinoa and pasta freeze well. Cook the wild rice for the stuffed acorn squash ahead of time and freeze in portioned amounts so it is easy to pull out when you want to add it to a meal. The chocolate almond bites can be frozen for up to two weeks or kept in the refrigerator for up to one week in a covered container. Use the extra time to get active with your loved ones with a skate, ski or winter walk before dinner! Amanda Nash is a registered dietitian and the Health Promotion and Nutrition Manager for the Heart and Stroke Foundation. This column was originally published in the Winnipeg Free Press on Friday, February 10, 2017.